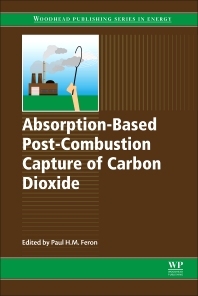 Absorption-Based Post-Combustion Capture of Carbon Dioxide provides a comprehensive and authoritative review of the use of absorbents for post-combustion capture of carbon dioxide. As fossil fuel-based power generation technologies are likely to remain key in the future, at least in the short- and medium-term, carbon capture and storage will be a critical greenhouse gas reduction technique. Post-combustion capture involves the removal of carbon dioxide from flue gases after fuel combustion, meaning that carbon dioxide can then be compressed and cooled to form a safely transportable liquid that can be stored underground. Research and development professionals in the power generation industry as well as postgraduate researchers in academia working on carbon capture. With a globally recognised reputation for science excellence in carbon capture technology, Dr Paul Feron leads CSIRO’s post-combustion CO2 capture research program, developing new cost-effective, environmentally-benign technologies to reduce atmospheric emissions from coal-fired power. As one of the pioneers of carbon capture research Dr Feron has been working in the field from the early 1990s, and has made a large contribution to both the technology and international policy of the research.